Last October we shared the results of Concept 1, which modeled all the transportation infrastructure changes in the Rosslyn Sector Plan that could be realistically built by 2030. 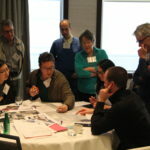 At the third public meeting on March 13, 2019, we presented Concept 2, which incorporates public feedback and lessons learned from the first concept, includes most changes listed in the Sector Plan, but keeps Lynn Street and Moore Street as one-way. We asked for comments on how well Concept 2 addresses community goals. The online feedback form closed on April 5. View previous meeting materials below under Public Process. In 2015 the County Board adopted a Rosslyn Sector Plan that included a set of transportation policies and recommendations. 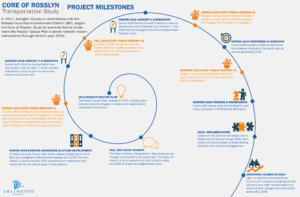 In 2017 the County’s Transportation Division, in partnership with the Rosslyn Business Improvement District (BID), is beginning the work of identifying short- and long-term improvements in the core of Rosslyn that will achieve the goals spelled out in the Sector Plan. This study will examine the feasibility and potential impacts of permanent changes to the street network in the core of Rosslyn, with the goals of improving safety and accessibility for all users – those walking, biking, using transit and driving. Long-term changes include the possibility of converting North Lynn Street and North Fort Myer Drive from one-way to two-way streets. 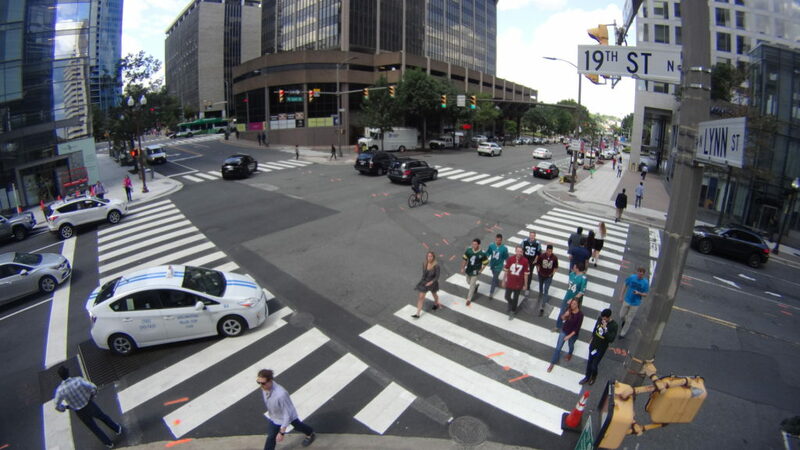 Concurrent with the transportation study, we are considering short-term, lower-cost opportunities to improve the overall street and sidewalk experience in Rosslyn. 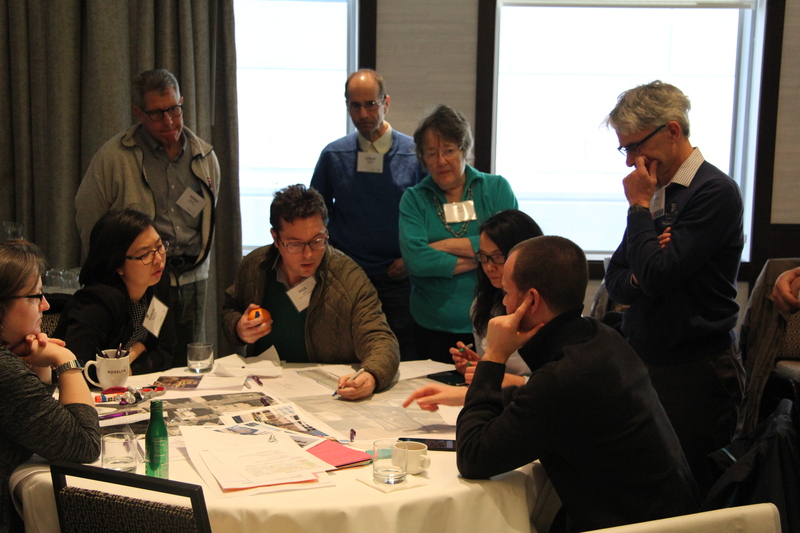 The effort began with a community workshop on March 4, 2017, where we introduced the concept of Tactical Urbanism – the use of short-term strategies to test long-term transportation solutions and capitalize on place-making opportunities. Examples of short-term enhancements include installing temporary curb extensions to shorten the distance one has to walk when crossing a street, and converting some underutilized street space for pedestrian use. 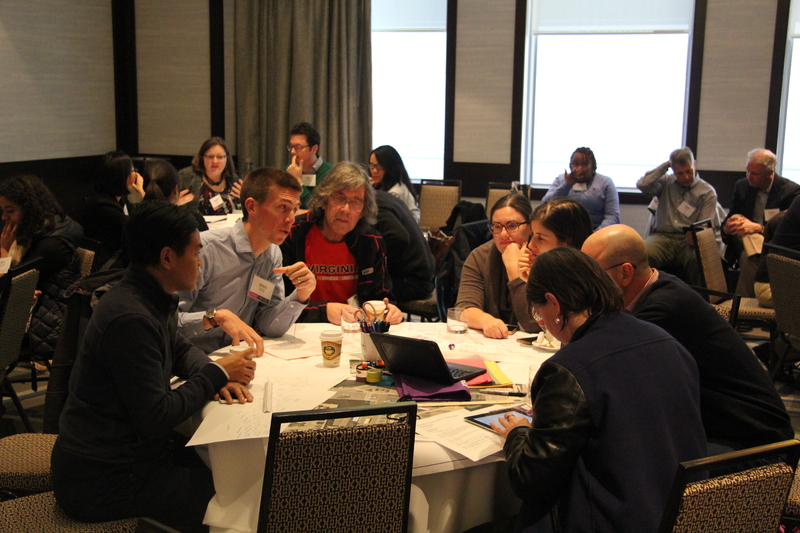 In the fall of 2017, Arlington County and the Rosslyn BID began implementing short-term strategies identified in the March workshop. View photos of street enhancements in our Flickr album. The study's second public meeting shared the results of Concept 1, which uses street network recommendations from the 2015 Rosslyn Sector Plan and analyzes how Rosslyn streets would perform if the recommendations are implemented. The first public meeting for the study presented the baseline analysis of existing transportation conditions in the Rosslyn core study area. At this open house in September 2017, staff from the County and the Rosslyn BID provided details on recent street enhancements and how they will inform the transportation study examining permanent changes to the street network in the core of Rosslyn. 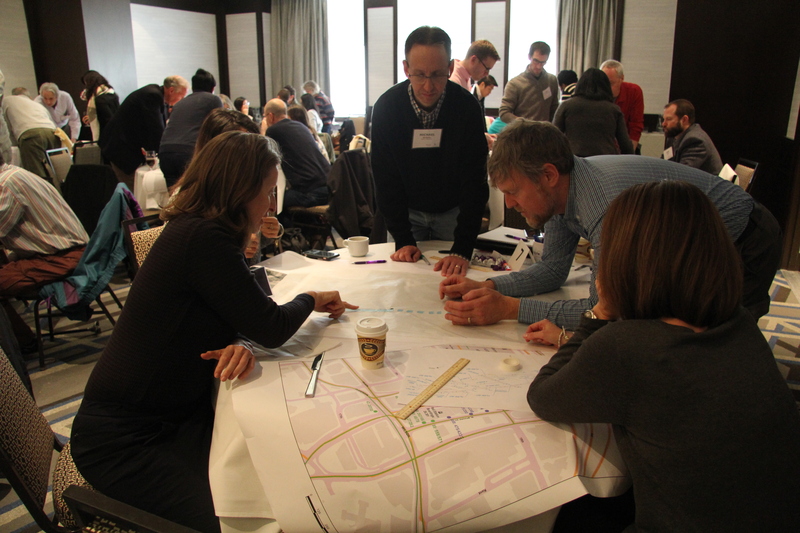 The Rosslyn BID and Arlington County hosted a community workshop in March 2017 to envision how vehicles, buses, bikes, and pedestrians can better use streets in the core of Rosslyn. 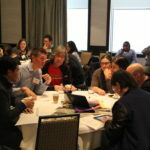 Participants, representing residents, local businesses, developers, visitors, commuters and transportation officials, examined some of Rosslyn’s busiest intersections and worked together to come up with pilot strategies to make them flow better. 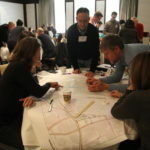 The County’s Transportation Division created a Stakeholder Advisory Group and Strategy Group to aid in identifying and developing improvements to the street network in the core of Rosslyn. Advisory group members, which include residents, business representatives, and the Rosslyn BID, are expected to attend meetings at key milestones throughout the transportation study process, and to share information about these efforts with their respective community networks.